Hello, and welcome to the Winter 2015 Essentials by Ellen Release Hop! I’m excited about the release of today’s new products from Essentials by Ellen – so excited about them that I couldn’t stop myself from making TWO videos. Eeep! I be cray cray, eh? Just love what the amazing Julie Ebersole has created…let’s get busy and check out just a few – be sure to read all the way through because there’s an awesome giveaway too! This hippo is the BESTEST, isn’t he?!? He looks positively puzzled…which is my expression half the time! lol. And he’s got a sweet little birdie buddy to hang out with – which I also love, two friends who are different from each other but friends nonetheless. Our world can use more of that! For my project, I created a watercolored one-layer card, and that big green balloon in the middle is a window peeking to the inside. Cuteness! I love that the die set has windows of all sizes – and even one that opens in the middle. Darling idea! Watch the video below or click HERE to watch it in HD on YouTube. Here’s a peek with the window open…the “to you” is on the back of the window that opens, and that cake peeks through from the inside of the card. For those that noticed the oops: my hand landed in that paint! Argh. I turned off the camera thinking I might have to start over. But – I put a lot of water on it, dabbed it off, more water, more dabbing. Once it was dry I took a this eraser to it and it was all gone. YEAH! Magic for just over a buck! Note that I’m travelling – if I’m not able to add a link to these specific products click HERE to go to the entire collection of Essentials by Ellen! And now for some dies! As you know, I like to share ideas for those who don’t like to color – or who are coloring-challenged. 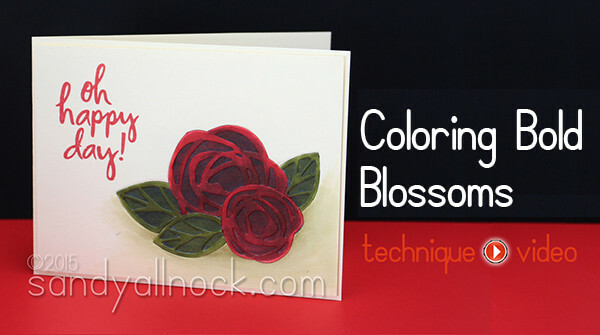 This video shows both the easy way – stop before you get to the harder part – or doing more coloring to make the flowers even more dimensional. Either works great! And in addition to the standalone Bold Blossoms dies, there’s a Bold Blooms stamp set shown in the video (used for the sentiment) that has similar flowers, and there’s a die set that matches it. See it all over at Ellen Hutson’s site. Watch the video below or click HERE to watch directly on YouTube! And, yay!!! I also get to give this new stamp set, called Wish Big (graphic attached) to a lucky someone! Please leave a comment to enter my giveaway! There is also a Grand Giveaway in the CLASSroom! To enter, be sure to leave a comment there, and at every stop along the hop by March 2nd; winners will be announced March 4th! I’m so humbled to be in such amazing company with some of my crafty heroes! *gasp* Go see what they have to offer! So go see Teri’s blog next – she always has amazing creations to share! After you’ve had a chance to peek at the whole new line – what’s your favorite must-have item in this release of new products? There are so many creative uses for Bold Blossoms dies that it is my favorite. Wow! You are so talented! Love this new release! I just started watching your youtube videos and I know I’m already hooked. I love to make cards but don’t have people to send them. Now I do. Oh goodness I could watch you color for days! LOVE this stamp set, SO cute!!! Love the birthday hippo stamps! So cute and love the blossoms too! These cards are absolutely beautiful and I love them so much. Sandy, you are rapidly becoming one of my go-to designers to watch! Absolutely adorable hippo card! Love how you used the window die. Hooray – I LOVE LOVE this hippo stamp set!!! THANK YOU for all the awesome inspiration and the chance to win! What a great technique, thanks for sharing. I like the idea of making a sticker out of the die. Sandy, I’ve watched almost all your videos and love all the different ways you use your stuff and thought I’d learned the basics. NOT, I would NEVER have dreamed that you could layer dies!!! Just one more thing you’ve done to amaze me. Keep it up, love all you do. 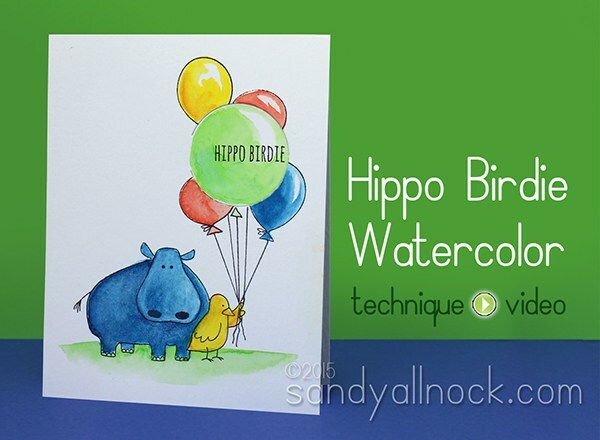 I am so glad that you included watercoloring with the hippo and birdie card. I’m just learning how to do this, but you showed how to fix it even if you mess up. Thank you. Also the black background with the red flowers is something that I definitely going to try. I make a lot of anniversary cards and that is perfect for them. So, either the die set with the blossoms for anniversary cards or the stamp set with the hippo and birdie that I would use for all of the birthday cards that I make (I make cards for all of my family and all of my husband’s family, while dealing with MS)- they would be my dream sets to have. If I don’t win them, I may have to sweet talk my hubby. Thank you for sharing your very beautiful cards!!! absolutely love the hippo card! Hippie birdie is too cute. Love hippo. Great card . Beautiful cards. I love your videos, you are amazing! Such a wonderful release. I love those windows and how you used the cake with the candles showing. I love the script sayings in this hippo set but even more I love the Bold Blooms set. I have an un”die”-ing love for dies. I coils never have to many. I live the hidden cake inside! What a treat! I am love with the hippo set. Would love to win it. Aren’t those balloons just the cutest! 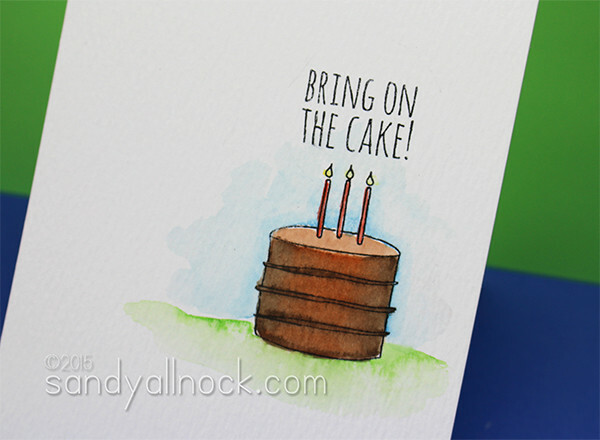 I really like your instruction on watercoloring stamps! Makes me want to try it out! Thanks! Love all your work and it’s been interesting to watch you trying out different water colors. Sandy, your hippo and bird are just adorable! Super cute cards and ideas Love the new items can’t wait to get my hands on them!!! Terrific cards! I loved them! Great videos, I love the hippo and balloons in the Wish Big stamp set, and also the scribble flowers. Thanks for the inspiration and the chance to win. What a fun set to play with. You used it well. your cards are so fun and beautiful! thanks sandy! All these sets are splendid and I love your water colouring! The balloon die opening is the best, gotta get that! Sweet cards and what a cute stamp for the giveaway!! Thanks for sharing! Your cards are great! Thanks for the giveaway too. Sandy, I love, love, love that hippo card; it’s fun, colorful, and it makes me smile. Thanks for sharing the technique you used with the Bold Blossoms. I love that little bird and the hippo! great birthday set! The hippo birdies are just so cute. I love the Kuretake Gansai Tambi watercolours. I told my husband the 36 set it what I want for my birthday. He kind of implied that my watercolour pencils, distress markers and many other random watercolour sets should suffice. I don’t think he understands my needs, lol. Great idea with the diecuts. I definitely need some of this stick it. It looks much thinner than my current ds sticker sheets which I really struggle to diecut with anything thicker than tissue paper.